Kudos to Music Director Eric K and the Redwood Symphony on this wonderful review in San Francisco Classical Voice about the February 10 concert at Cañada College in Redwood City, California. 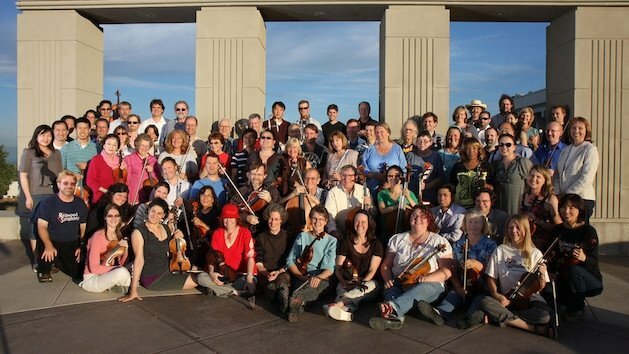 We couldn't agree more with critic David Bratman who said, "Redwood, though a nonprofessional orchestra, is composed of highly talented players who were at their finest here." The Redwood Symphony, under Music Director Eric K (nee Kujawsky), gave a long concert at Cañada College on Saturday, February 10, featuring three challenging works, one by Mozart and two from the 20th century. The best performance of the evening was of Stravinsky’s Petrushka, the sometimes-neglected middle panel of the triptych of ballets that made the composer’s reputation. It was presented in the common 1947 revision, with the more colorful percussion parts from the 1911 original added back in. But it was not just for that reason that this often shockingly dissonant work felt spicier and more pointed than usual. Redwood, though a nonprofessional orchestra, is composed of highly talented players who were at their finest here. Deliberately grotesque cries, searingly imprinted yet sometimes funny enough to make the audience laugh, came from the winds and brass. The performance was accompanied by supertitles describing the ballet’s events. This was a little distracting but highly informative, the more so as it explained various cryptic-sounding interjection passages, particularly in the final tableau during which a variety of characters pass quickly across the stage, including a bear, a goat, and a pig. The orchestra is recording Petrushka, so it seems to have received the bulk of rehearsal time. The other works on the program were wobblier technically, yet not so poor as to prevent much fine individual playing throughout, nor to keep the composers from sounding entirely like themselves, Kirke Mechem no less than Mozart. The Mozart work was his Sinfonia Concertante in E-flat, K. 364, functionally a double concerto for violin and viola. If intonation was a problem for the orchestra, the often-elusive elegance of Mozart’s phrasing was not. Smooth and blended — especially with each other — playing from both soloists, violinist Jassen Todorovand violist Paul Yarbrough, gave the occasion a full measure of gallantry. 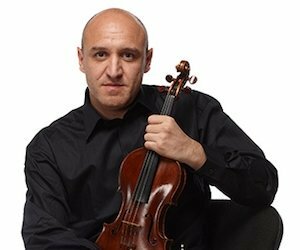 Both soloists are professionals who are known locally — Todorov as a teacher at San Francisco State and Yarbrough for his long service in the Alexander String Quartet. The most unusual offering of the evening was Mechem’s Symphony No. 2, commissioned in 1967 by Josef Krips, who conducted the San Francisco Symphony in both Mechem symphonies with great enthusiasm and, reviews tell us, great success. But after Krips retired from San Francisco in 1970, Mechem found no further market for such works and wrote no more symphonies. He retreated instead into choral music, long a haven for tonal composers in an atonal world, and it is for that music that he is best known today. The Second is a worthy slice of chromatic tonal modernism. In Dr. K’s preconcert talk, he mentioned Prokofiev and Howard Hanson as comparable composers. I heard, however, neither the keen angularity of Prokofiev nor the slick smoothness of Hanson. Rather, I was most reminded of the intermittently jagged and coy orchestral works of Mechem’s teacher Randall Thompson, also better known for his choral music. Mechem still has a distinct personality, though. His style here is more earnestly striving and less perky than Thompson’s, though it attempts perkiness, especially in the Scherzo quodlibet on sailor tunes, some of which are briefly recognizable. The orchestration is clean and clear, full of variety and challenging passages. The performers managed to put the point of the music across, especially in the movement codas. The suddenly hushed first movement coda in particular was a little gem. The composer, long a San Francisco resident and still hale at 92, was present at the concert. In his brief onstage appearance at the end of the preconcert talk, he and Dr. K revealed that in April 2019 the Redwood Symphony will present the first full performance of Mechem’s latest opera, Pride and Prejudice (after the Austen novel). It should be an instructive and persuasive experience.